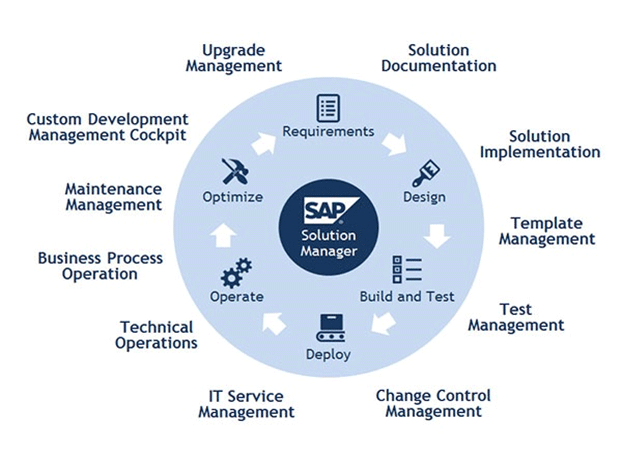 SAP Solution Manager (SolMan) is an innovative, multi-purpose Application Life-cycle Management (ALM) solution, that is tremendously helpful in allowing businesses to build and implement the right IT processes to manage every aspect of their Enterprise application landscape. With plenty of niche toolset within, its provides a unique repository for all documents, and technical objects result in the day-to-day IT processes. All the information is stored centrally and is accessible by all other functionalities in SolMan. From designing and mapping out business processes, to monitoring the day-to-day use of the same, SAP Solution Manager allows for optimization of the organization’s compliance, utilizing ITIL certified tools. SAP Solution Manager is one of the solutions that met 100% of the PinkVERIFYTM general, core and integration suitability requirements of ITIL (Source: https://www.pinkelephant.com/en-US/PinkVERIFY/PinkVERIFYToolsets). This leads to the control of costs on upgrades and ongoing application management, supporting business innovation, and shortening the time it takes to bring real value to an organization’s business. The most impressive enhancement comes with the integration of Solution Documentation with the rest of the ITIL functionalities in SolMan. The Solution Documentation / Implementation tool allows paperless validation and documentation of business processes. With the integrated document management system and its electronic signatures, documents can be released, and their status checked. The tests essential for validation can also be scheduled, released and recorded electronically. Having access to such information allows those providing support to understand what has been implemented and how this was achieved. Tool for Change Control Management ensures that changes to business processes are carried out in a controlled and consistent way. It provides a fully auditable SAP change management and change deployment process. Also, the necessary documentation is adapted, and the changed functionality sufficiently tested. Validated status of systems can also be maintained. Test Management Tool can manage all aspects of the testing process which also includes a full test automation solution without the need to rely on other 3rd party tools. This is a fully functioning, comprehensive test management suite that provides stiff competition against the traditional, licensed products in the marketplace. Template Management tool increases the efficiency of global roll-outs and ensures that business processes run smoothly. IT Service Management tool provides for a central collection of errors & user requests and supports the ITIL processes like Incident Management, Problem Management, Change Management and Request Fulfilment. All information is stored centrally in an integrated manner and is combined with comprehensive reporting and analytical tools to ensure that the Incident Managers have full visibility without the need to speak to individual resolver groups. Business process operations can automatically monitor the health of all the core business processes, and appropriate alerts are raised for the attention of the relevant business process operation or technical teams (as applicable) when specified threshold values are breached. Maintenance Management Tool supports the correct patching and updating of the SAP landscape, as well as the task of informing critical updates. But of all its uses, Technical Monitoring Tool is the one that yields the most benefits for the broader SAP community. The monitoring capabilities of SAP SolMan makes it easier to keep the system healthy, allowing performance improvement, reducing downtime, and needless duplication through reusable templates. Improved patch and upgrade management & synchronization through a single system. Automated configuration tracking facilitates a fully maintained knowledge repository to keep track of all configuration changes. Centralized Management of the entire solution landscape and multi component projects. Reduces Administration Effort by real time monitoring of systems, interfaces and business process. Easy Integration of IT landscapes that includes both SAP and non-SAP applications. Faster ROI by accelerated implementation and continuous improvement. Minimizes Downtime with its powerful Technical Monitoring capabilities. Reuse Templates as they are build-once, deploy-to-many, which saves time and controls costs on repeated processes, helping to standardize deployments. Organizations have begun to understand and fully appreciate what SAP Solution Manager brings to the table. Making it the single source of truth for all SAP customers, SAP Solution Manager has now truly become indispensable to any business that runs on SAP.